We’re so familiar with glass in everyday items that we may not realize the limitless potential it offers for art. These Japanese artists however have found some truly enlightening ways to harness its expressive power. As windows replaced paper shoji screens in the 19th century, glass made its glittering entrance onto the Japanese art scene. Today glass artists make use of this most versatile substance to reinterpret tradition, and shatter preconceptions. Here we take a look through the glass art of ten of Japan’s most fascinating creators. If you haven’t heard of the Japanese classic Tale of Genji, here’s a novel way to get acquainted with it! Artist Akane Yamamoto brings the tales to life with her folk-craft-inspired glass sculptures. ‘Butterflies’ refers to a chapter where the eponymous hero organizes a spectacular garden party for the visiting empress. You can see the references in the intricate floral patterns that decorate this butterfly’s wing. This glass art is on display at the Tomo Museum in Tokyo. Yukito Nishinaka's glass art uses the material in unfamiliar ways; but looking at his work you wonder why we don’t always use glass! The inspiring teabowl shows that glass artworks can achieve the same level of beautiful and idiosyncratic artistry as the more traditional ceramics. Nishinaka also lends his creativity to other facets of traditional Japanese design. Stepping stones are an important component of the Japanese garden, as they enable the viewer to move through the views of the space without being sullied by rain or soil. What better way to represent this visual movement and purity than with glass? See more of Nishinaka’s glass art at nishinaka.com! Glass artist Niyoko Ikuta makes use of just two materials to create these futuristic sculptures: both the brilliant glass, and the light that is refracted through it. By layering gently undulating sheets of glass, not only does Ikuta create these incredible wave-like structures, but she is also able to explore the reflected light that subtly animates each part of the sculpture. See more of Ikuta’s fascinating works at yufuku.net. Bathed in a soft blue light, this glass sculpture reveals the beauty in decay. Royal College of Art graduate Mika Aoki combines a fascination with the physical and the organic to produce her thought-provoking installations. 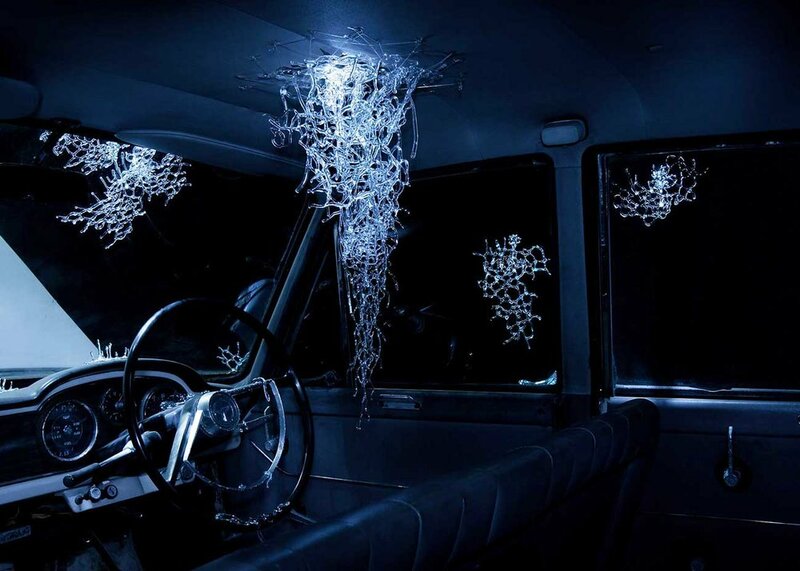 Carefully crafted glass structures seem to grow in mysterious fungal forms through this abandoned and rusted car. By using industrial materials, Aoki is able to highlight the supremacy of nature, and to inspire reflection on what will be after we are gone. Learn more about this artist at mikaaoki.jp. This beautifully ornamented box seems like a fine example of lacquer craftsmanship, but look again! It is fine craftsmanship indeed, although the material is not lacquer, but glass! Artist Kyohei Fujita spent 60 years attained an unrivalled perfection in glass blowing for which he was awarded the medal of cultural merit. This treasure is decorated with gold and silver leaf to portray the plum blossoms of early spring. The skill of Etsuko Tashima’s thought-provoking sculptures is that they combine ceramics and glass into a forms that don’t appear to be either material. In this piece, Cornucopia II, the effect is that we see petals of different stages of growth in a blooming flower. Check out imuraart.com for more of Tashima’s work! Related: Ceramic Art’s Hidden Gems: 6 Japanese Innovators to Watch! Designer Kazuko Mitsushima’s contemporary glass jewelry creates forms and colors that no precious metal can reproduce. When Mitsushima began working with glass it was considered a poor imitation of jewels. But she refused to be restricted, and persevered through years of careful experimentation to create these unique pieces that in many ways surpass the limitations of stone. 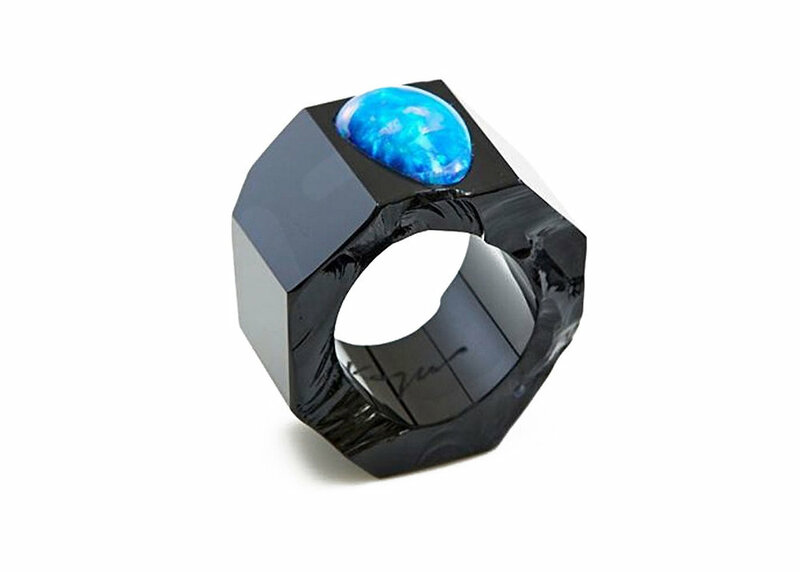 This particular ring pairs a lacquer-black glass ring with a lagoon blue opal. Mitsushima uses the natural irregularity of the material to craft this elegant and intriguing piece. Mitsushima’s work is available at the Gallery Deux Poissons in Tokyo. There is a sense of the archeological artifact within Hidenori Tsumori’s glass art. By combining glass and clay in Tsumori produces works such as this sculpture Remains of the Day, which provokes the viewer into reflection on things that are lost, and things that remain. Explore Tsumori’s world at yufuku.net. Midori Tsukada sees in glass an opportunity to express herself through natural processes. 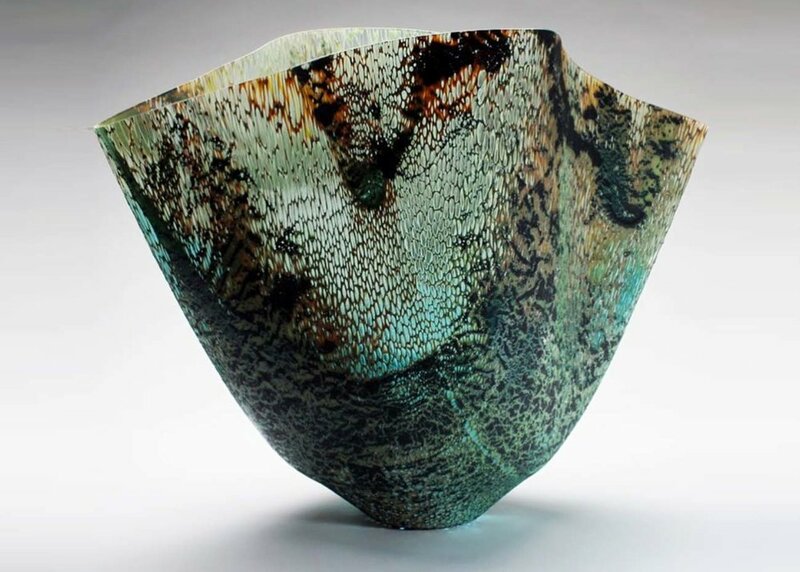 By blending the glass with other materials, such as metals, and allowing the forces of heat and gravity to play upon her creations, she is able to create these incredibly expressive and otherworldly glass works. Enjoy more of Tsukada’s work on her website. Ikuko Ogawa is a master of Edo Kiriko, which is a style of glass cutting developed in the 19th century Japan. Although Ogawa’s creations are informed by history, the sweeping, multi-layered designs are very much a product of her own aesthetic. This art glass vase, the Rhythm of Snow, portrays the musical movement of snowflakes as they dance and tumble through the dusky evening sky. Check out more of Ogawa’s works at Panorama. Which is your favorite artist? Let us know in the comments below!